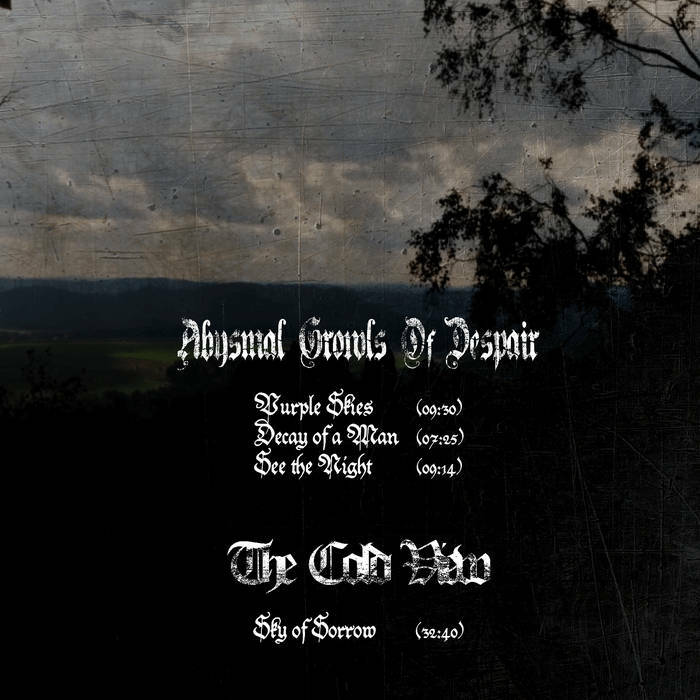 This is a review of a split album between France's Abysmal Growls Of Despair and Germany's the Cold View, 2 solo projects that have been featured before in this zine and the album is called "Songs Of The Deepest Skies" and was released by Frozen Light and we will start off the review with Abysmal Growls of Despair which continues the atmospheric funeral doom metal sound of previous recordings. His side of the split starts out with atmospheric sounding synths and a few seconds alter a very heavy sounding bass guitar kicks in and the music starts going for more of a funeral doom metal style while also remaining atmospheric at the same time and after a few minutes deep yet guttural death metal growls start becoming a huge part of the recording and all 3 of his tracks are very long and epic in length and they also stick to a slow musical direction throughout his side of the recording while one song also brings in a brief use of clean playing, the production sounds very dark and heavy while the lyrics cover despair themes. 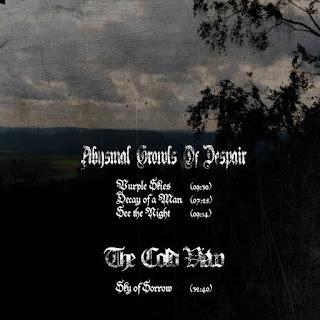 In my opinion this is a another great sounding recording from Abysmal Growls Of Despair and if you are a fan of funeral doom metal, you should check out his side of the split. RECOMMENDED TRACK "Decay Of A Man". Next up is The Cold View who also continues his mixture of drone and funeral doom metal from previous recordings. His side of the split starts out with acoustic guitars which also gives the music more of an avant garde feeling and you can also hear synths in the music along with a great amount of drones and when guitars are added into the music they add more elements of funeral doom into this 30 minute long track and there is also a good mixture of both clean and heavy parts while the vocals are deep death metal growls and there is also a great amount of percussion work being utilized, the production sounds very dark and heavy while the lyrics cover nature, depression, darkness, despair and loneliness. In my opinion this is another great sounding track from The Cold View and if you are a fan of funeral doom metal and drone, you should check out his side of the split.